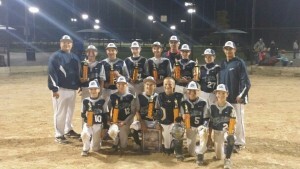 October 18th weekend the KC Elite Silver team ran the table with undefeated record on their way to winning the Triple Crown Fall State Championship at Legacy Park. They had great pitching, timely hitting and solid defense. This group of boys has worked very hard and has continued to develop through the fall. Manager Dan Aguilar & coaching staff have high hopes for this group heading into 2015 Spring and Summer season.